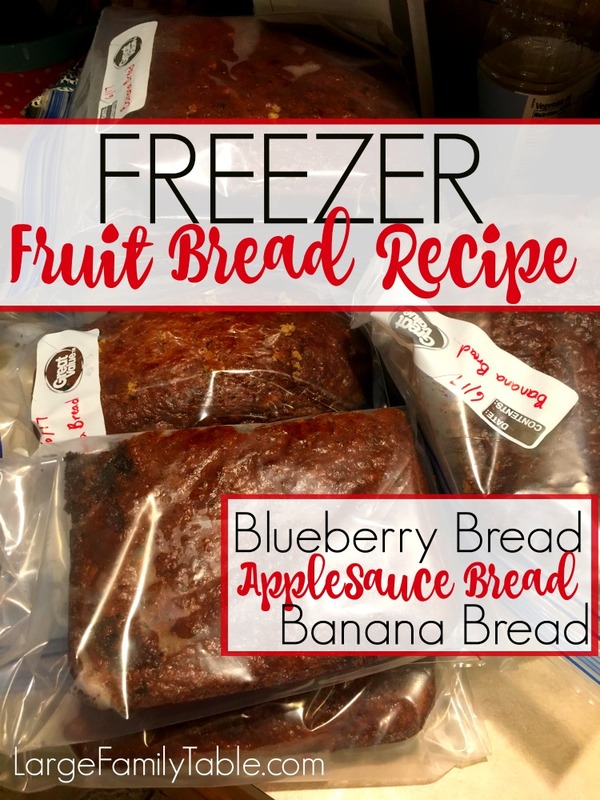 I often share on my freezing cooking days about making various fruit breads and freezing them for the upcoming month. I run my mouth freely about blueberry bread, applesauce bread, and banana bread. My recipe is very simple and easy (how I roll 🙂 ). I make many pan fulls at a time and freeze for the coming weeks. If we need a loaf of blueberry bread for breakfast I will give everyone a slice with a yogurt, apple, or banana on the side. Add a cold glass of milk and the kiddos have lots of energy for our morning forest adventures. The freezing and defrosting process is very simple. I store each loaf in a gallon size freezer bag. I’ll either set a bag out in the refrigerator the night before we need it or I put it in the microwave for a quick defrost the morning of. I also have a similar variation of fruit bread in the bread machine if you’re interested. Combined your dry ingredients in one bowl and mix well. Add your wet ingredients in another bowl and blend together. Join your dry and wet ingredients together and mix on medium speed. Fill baking dishes 1/2 full with your fruit bread mixture. Place filled baking dishes in preheated oven at 350 for 45-minutes to 1-hour. Let your loaves cool appropriately. Place in gallon size freezer bags (for 9×13 size pans we cut in 1/2 placing each half in its own freezer bag), removing as much air as possible. Before use place in refrigerator the night before needed or defrost using your microwaves defrost setting. Enjoy wonderful blueberry, apple, or banana bread with your family! I use this recipe to make a 9×13 dish, 9×11 dish, 8×8 dish, and 9×5 dish at one time. LET ME KNOW IF THIS RECIPE WORKS WELL FOR YOU! Thank you so much for your recipes and the helpful videos. 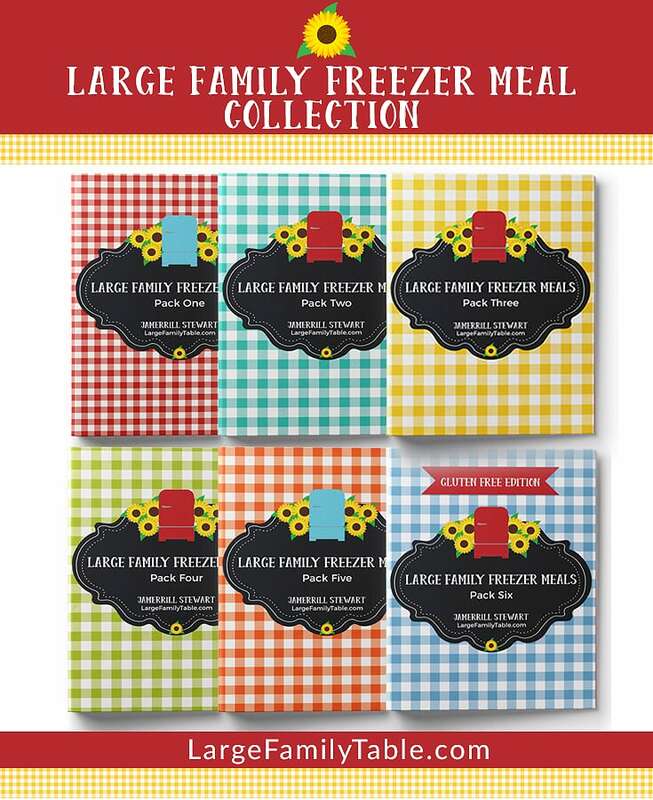 I don’t have a ‘large’ family, but I want to start filling the freezer with meals and breads for times when we’re super busy or just too tired to cook from scratch. Hey there! I am a huge fan of yours. This is my first time to comment. 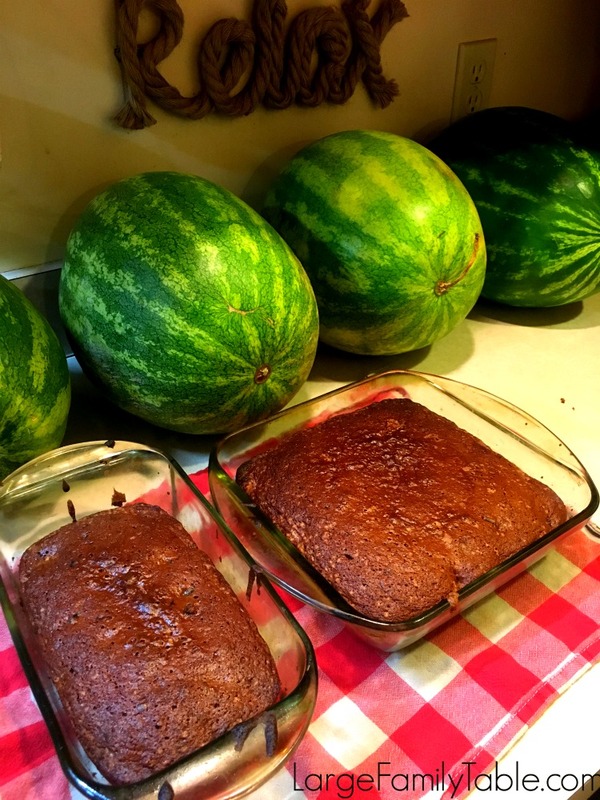 Can I reduce the amount of white sugar in the fruit bread recipes? I’ve made it all three ways with fresh, frozen, and defrosted berries. How did yours turn out? I made it with a combination of shredded apples and carrots, and misread 5tsp of vanilla as 5 TABLESPOONS. The result tastes a lot like cotton candy bread, but still very eatable. Next time I’m reducing the sugar by a cup and curbing my enthusiasm for vanilla, but I will definitely be making it again! I am just curious. What would be the best way to half this recipe. I unfortunately don’t have a large family and my freezer wouldn’t fit that much. I look forward to making blueberry bread with fresh blueberries I just got. P.s. I love your family and hope to have four children if God blesses me. I have two sons, halfway there! It just took me two years of unexplained infertility to get my second son. Wish me luck with two more. Can I make this recipe with canned pumpkin for my fruit? You don’t use loaf pans for your fruit bread recipes? You use 9X13??? I can’t wait to try making these! I have a home daycare, and I think the kids will love it. Do you always wait for your bananas to brown before you throw them in the freezer? I never have any brown ones at the end of the week, can you use fresh yellow ones if you freeze them beforehand? I just have to pop in here and give you a ton of thumbs up! I’m a newer subscriber, I’ve already had an email sent to me with your fabulous recipes, wanted to have even more sent my way. I am looking at your website page here, it’s so well put together, easy to understand etc. Very professional! I’ve made this with bananas and applesauce! This bread is simple, tasty, and most importantly my kiddos love it! I also divided the recipe by 5 to make one 13×9 dish. I made the applesauce bread today and my guys LOVED it. They said to say thank you Jamerrill lol. I did slice some apples real thing and sprinkle with cinnamon to throw in there. I just need to get it to the freezer and out of their reach now.